A commemorative service is to be held marking the loss of six soldiers killed in a Lisburn bomb attack 30 years ago today (Friday). had completed a charity fundraising half-marathon and fun-run on June 15, 1988, when a bomb destroyed their vehicle. Lisburn and Castlereagh City Mayor, Councillor Uel Mackin, said: “The loss of life, devastation and destruction that took place that terrible evening three decades ago is something that so many local people still remember and the council wants to ensure that anyone who wishes to pay their respects can do so by coming along to the Service on Friday. “The six young soldiers had competed in the annual half marathon and fun-run and were returning to their base when a terrorist bomb destroyed the vehicle in which they were travelling. 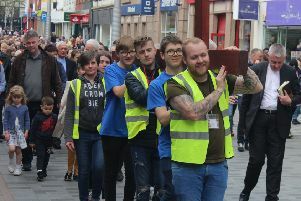 “There were some 11 injuries to bystanders who were in Lisburn that evening as many young people, families and children had participated in the event and the then town was very busy. The story is well documented and sadly none of the six men survived. “One can only contemplate the shock and grief of their relatives who were left in the deepest mourning. “It is 30 years ago now, and a lot of time has passed, but the memories of those young men who were killed will stay with their families forever and of course they will never be forgotten by the council or the people of Lisburn. “It will be a privilege for me to attend this deeply poignant occasion as one of my early mayoral duties and to pay my respects to the men who served Queen and country.” A number of special guests will attend the 30th Anniversary memorial plaque rededication service and wreaths will be laid in remembrance. Traffic disruption is expected from 5.30pm to 7.30pm.